Finally, after much hullabaloo, BBM for Android and iOS has arrived. This was news a few days ago, however I wanted to give the app a fair shake before review. After testing, prodding and giving the app a fair chance it’s time air my views. I’m going to say right off the bat that I wanted to hate BBM. I didn’t see any purpose for it with a plethora of messaging apps available to us already. 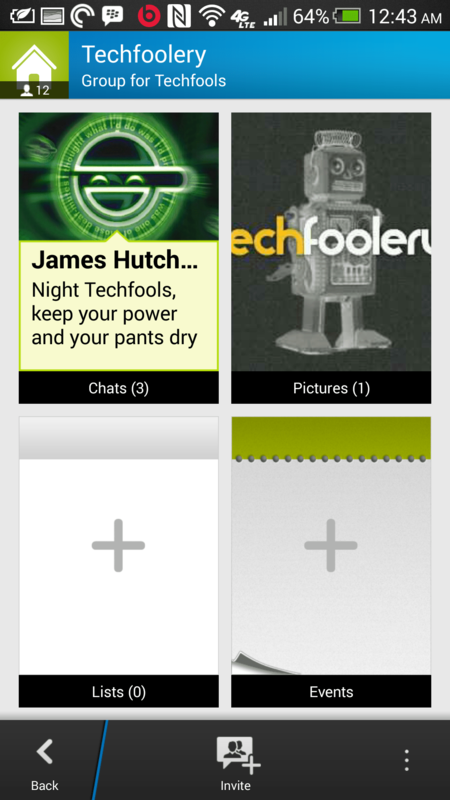 There are tons of people using Hangouts and even more using WhatsApp. Plenty of people are perfectly happy using SMS text messaging. To say I was going into this with a bias against the app is an understatement. 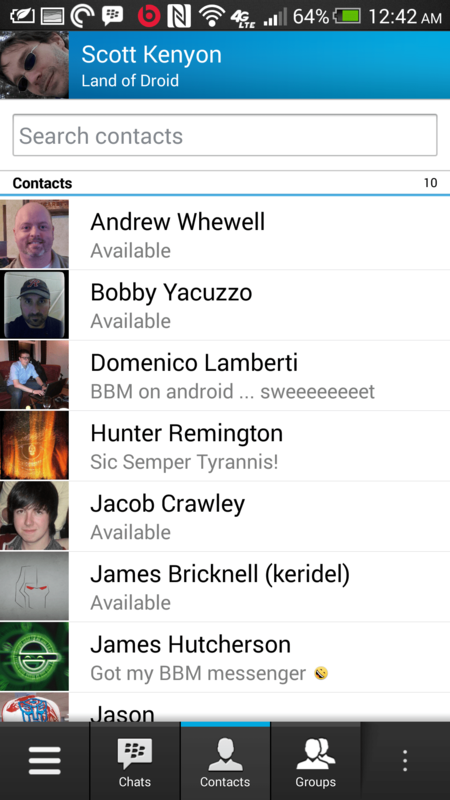 If BBM for Android had come out two years ago, I could possibly have entertained the notion of messenger dominance. I just failed to see the point. Now that I’m done explaining how I felt going into this, on to the review. To be safe and avoid the zillions of phony apps on the Play Store, I went to BBM.com and followed their official link to the app. The download was fairly fast, installed and ready to go. I had been able to jump the queue by signing up with my email address on BBM.com a few weeks ago, so off to the races I went. The first thing I did was dive right into the settings. 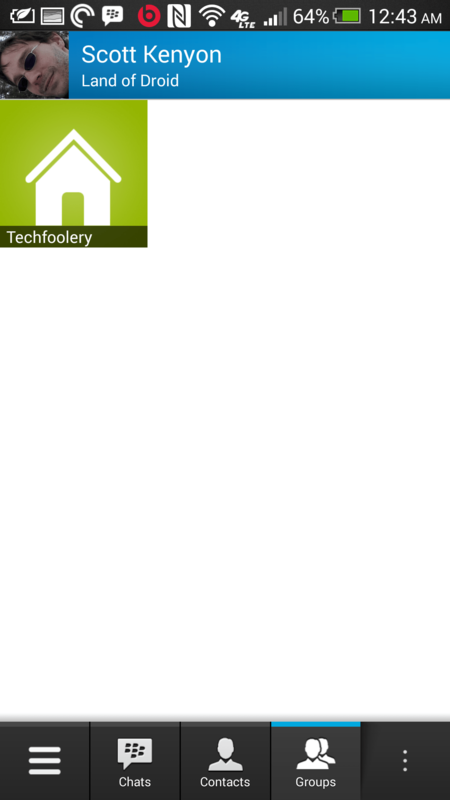 There are toggles available for notifications and vibrate, and an option to pick the sound for alerts. The default BBM tone is pretty well done, but could be louder. If your device supports a multi-colored LED you may choose the color. Other toggles include saving chat history, showing action bar within the keyboard (which I disable, I’ll touch on this later), adding contacts by tap and security question in invites. There is also a button for deleting your saved chat history. You can switch your layout for contacts from grid to list, edit blocked contacts and access the legal documentation. If you find a bug, there’s a button in the settings to report problems. There is a pull out menu available on the left hand side of the screen. This has become the norm in Android apps, and is nice to see here. You can access a list of your chats, a list of contacts, the groups you’re engaged in, updates from contacts and groups and new invites. Most of this is pretty self-explanitory, however updates allows you to see when your contacts join groups or change their profile photo. If someone is trying to invite you to a chat, it’ll be in the invites. 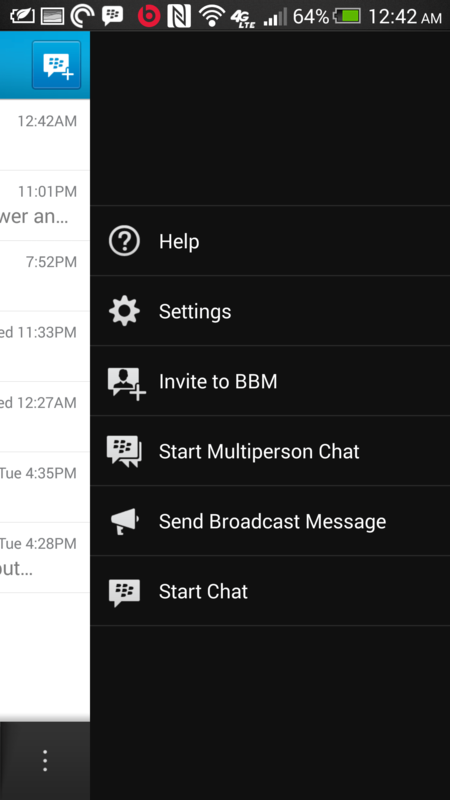 The overflow button is where you access your settings, help, invite others to BBM, begin a non-group multi-person chat, broadcast a message to your contacts or start a one on one chat. In the beginning I had zero contacts. This changed after one of the Google Plus communities I frequent wanted to test out the app. A short time later, I had legitimate contacts who could now access the app and I could actually start testing. I feel this is a huge hurdle to overcome for a lot of people. Blackberry users are in a minority in the smartphone market. 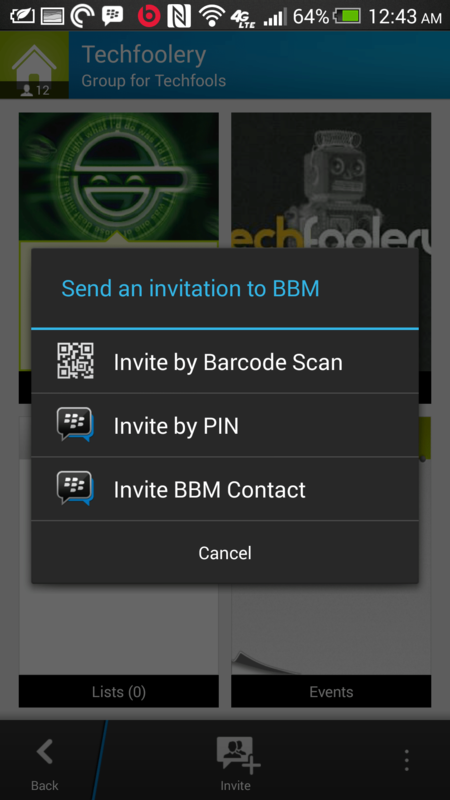 It’s not easy to find active BBM users. With my list loaded up, I began messaging. The interface is really well done. 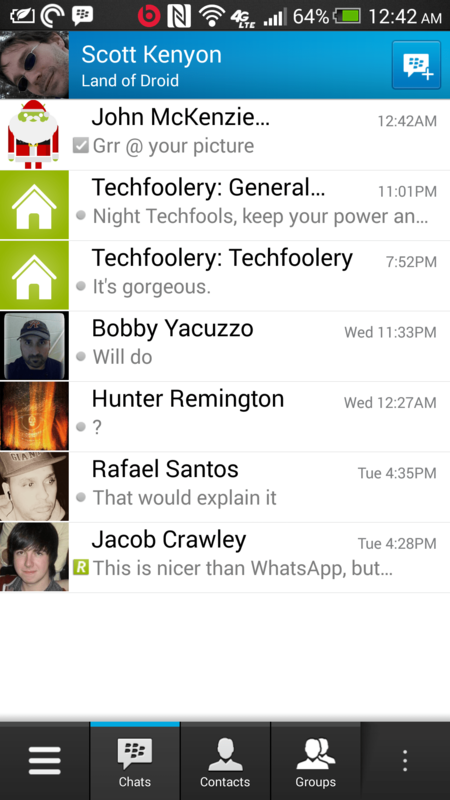 Photos contained in chat bubbles make BBM simple and clean. In a one on one chat, your line will be gray, while the other user’s line is blue. If you chat within a group, there are different colors for each user. I am not sure this is necessary, but it’s definitely a nice touch. Every message is time stamped and, true to form, delivery and read receipts for each message sent. Long pressing a message will allow you to copy it. Emoji are included in BBM. While I don’t particularly care about them, this button serves an important purpose. If you disable your action bar in the settings, tapping the Emoji button allows you to access the bar. This will allow you to send photos in one on one messages as well as invite more people to the chat. My first few photos I tried to send were very slow to upload and push. I’ll attribute this to launch day overload of servers, as it disappeared later. I created a group for my Google Plus community and had several people join. Group messaging worked flawlessly. When creating a group, you can provide a group name and description. 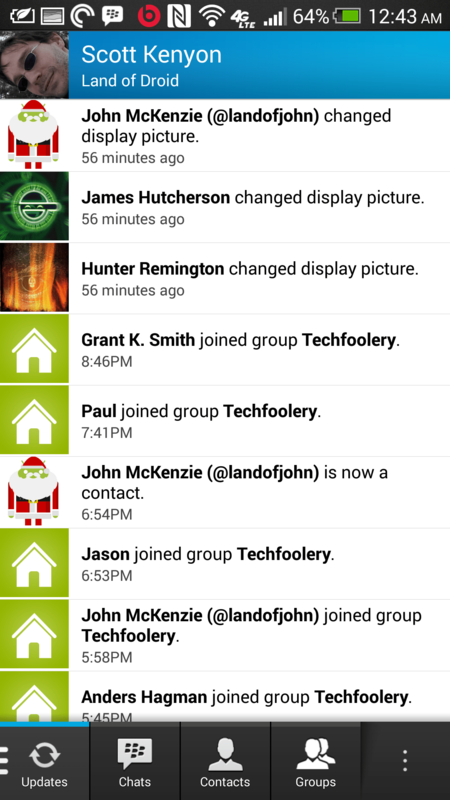 There is also a toggle for allowing all group members to invite to the group. This has proven handy for my uses so far, but if you wanted a private group you can be the sole person allowed to invite. Groups are currently limited to 30 members. In group chat, you cannot upload images directly to the chat (the way Hangouts handles this). Instead, there is a separate area from the main group screen to upload and view the photos. There are other areas for lists and events, which is a nice touch. Another bonus is the ability to have multiple chats within each group that any group member may access. I’ve been using this app as heavily as I can the past few days. To be honest, I love it. The UI and UX are very intuitive and the app is easy to use. Group chatting with the folks from the community has been a ton of fun. I highly recommend you give it a try. 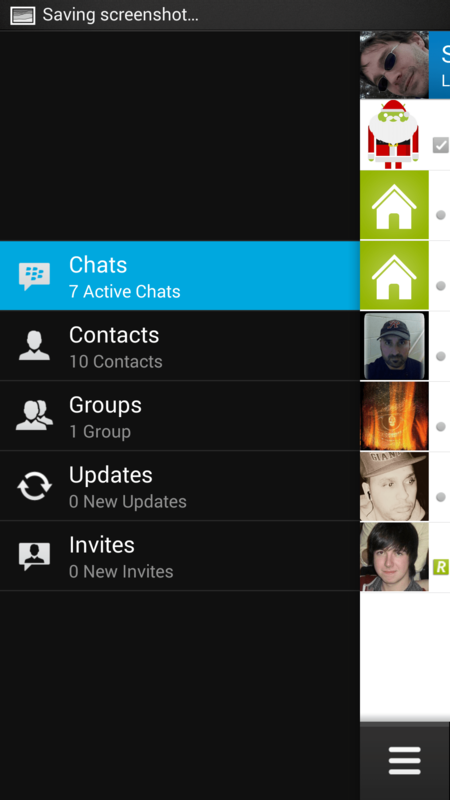 From the get-go I wanted to hate BBM for Android and didn’t see the point. Now my view has changed, and I hope people adopt it as a viable platform. Great job Blackberry! Let’s hope you can keep this updated and add features to keep it relevant!